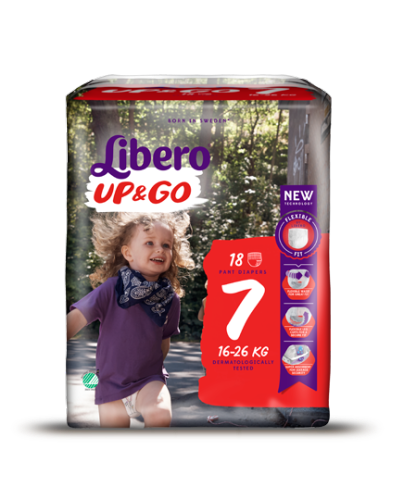 Libero UP&GO has a soft, breathable non-woven outer material that allows air to circulate, keeping the baby’s delicate skin dry and comfortable, minimising irritation. Libero UP&GO helps to keep the baby’s skin healthy. After all, the silkiest, most sensitive skin deserves nothing but the gentlest materials. Libero UP&GO pull-on pants are made from soft material, gentle against the baby’s skin. Elastics around the waist and legs help provide a perfect fit. The anatomically shaped core enables a close fit between the legs, allowing the little one to move freely. All Libero UP&GO pull-on pants have a super-absorbent core that can provide hours of leakage protection. This high absorption capacity, combined with the nappy’s effective leakage barriers, keep the baby’s skin feeling dry.